TAPAS TIME – Bulla Gastrobar Adds Happy Hour Foods — Rona. 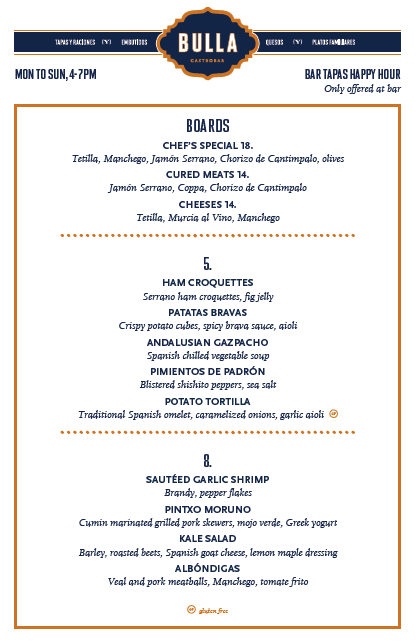 Winter Park – Drink specials at the Bulla Gastrobar bar have been a great deal for awhile, and now this contemporary Spanish restaurant is discounting tapas too. Sit at the bar from 4pm to 7pm any day, and you can have specialties including spicy patatas bravas, chilled Andalusian gazpacho, and garlicky shrimp for $5, $5 and $8, respectively. That's dinner, right there, although I personally will always add on a Huevos Bulla, just because I love it.